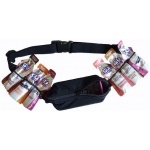 The Energy Belt has all the features and benefits of the Original SPIbelt, with 6 Gel Holders on the band. Sleek, Expandable, Secure and best of all, it Does Not Bounce, Ride or Slip during Physical Activity. The SPIbelt Expands large enough to hold any iPhone (including case), Blackberry, Keys, Up to Five Energy Gels, Medication, EPIpen, Small Camera, Passport or any of your other Small Personal Items (hence the name). In addition, the Energy Belt allows you to carry a further 6 gel packs on the belt band with easy access and removal during those long runs. Don’t worry if this item is on backorder the normal transit time to us is 5 days, so you will get it quicker than you think, best yet we will ship the rest of your order on us while you wait!